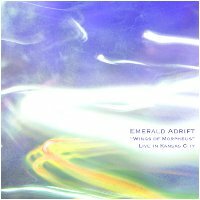 It is our distinct pleasure to welcome David Herpich back to Earth Mantra, with his latest release as Emerald Adrft, called Wings of Morpheus: Live in Kansas City. As one might deduce from the title, this is a live album, recorded during a concert David performed at the Electro-Music Festival in Kansas City in the summer of 2009. Unlike some live recordings, however, where only the best excerpts are chopped out of a much longer recording, this album presents the entirety of David's amazing performance, note for note, with only the momentary pauses between pieces excised. What you hear in this remarkable recording is exactly what the audience heard that day. Incredibly, David reports that he had originally planned and prepared to do a sequencer-based concert, with much more rhythmic material, but for reasons unknown about an hour before he went on, he decided to jettison the initial plan and "instead fly into the complete unknown", performing a total improvisation for the audience. The only preparations he made were to select a group of timbres for each piece, with no preconception of any melodies, harmonies, or formal structure. When the concert began, he simply loaded up the timbres, hit 'record', and started performing. When he thought a piece had reached its end, he stopped. Everything came out of the immediacy of the moment, with intuition leading the way, rather than planning, logic, or analysis. And the results are simply revelatory. Like all of David's work, the music is immaculately performed and the sound design is exquisite. But what really sets David apart is the sheer sophistication of his compositions. He is always exploring new territory and pushing the boundaries of tonality, structure, and experimentalism. His music is somehow deep enough to satisfy the most discerning and demanding academic listener, while at the same time remaining thoroughly approachable to anyone listening for the first time. The fact that David is capable of producing such immensely deep and highly structured material while "flying into the complete unknown", improvising in real time with no set plan of any kind, is quite frankly mind-blowing. Indeed, it is our firm belief that David Herpich is one of the most talented and innovative electronic musicians active today, at any level, whether he is composing in the studio, performing live with an orchestra of other players, or simply improvising solo in front of an intimate audience. His music has a depth and breadth that most artists can only envy, and his command of the keyboard really must be seen in person to be fully understood and appreciated. So it is with great pride that we unveil Wings of Morpheus: Live in Kansas City, another jaw-dropping achievement by Emerald Adrift. Highly, highly recommended.